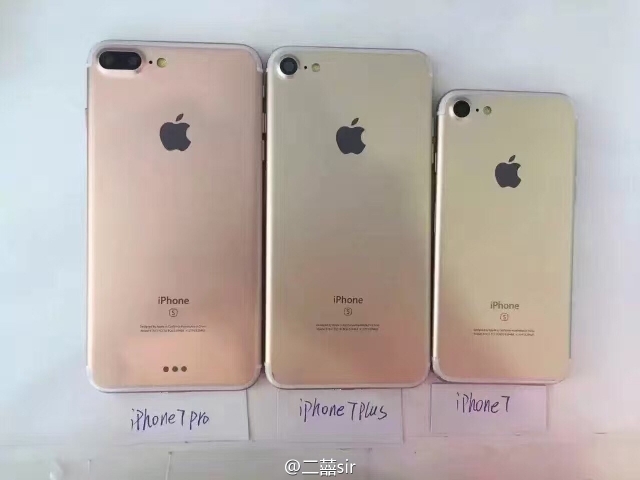 A new spy shot has leaked, allegedly revealing the rear case design of three iPhone 7 models dubbed the iPhone 7, iPhone 7 Plus, and iPhone 7 Pro. The photo follows another leak earlier this week that claimed to show the front of each model. Last month, a pricing leak suggested that in addition to the regular iPhone 7 and iPhone 7 Plus, Apple is planning to launch a new iPhone 7 Pro model. As purported, the iPhone 7 Pro appears to be equipped with much the rumored dual lens camera and aSmart Connector. According to the photo, these features are not present in the iPhone 7 Plus though the iPhone 7 and iPhone 7 Plus do appear to have a larger and likely improved camera as compared to the iPhone 6s. Take a look at the photo below and let us know what you think of these three devices as Apple's line up for the iPhone 7.